That, readers, is a review -- and an accurate one -- in seven words. Oh, were we all able to be so concise! But citations of Amazon genre categorizations are not why you visit this site, so onward I press. In my review of the debut Pointed Man Band album Swordfish Tango from 2013, I wrote that the album was a "combination of Tom Waits and Shel Silverstein, the Beatles and Parisian cafes, the music [smelling] of hardwood floors and flannel and wood construction blocks." The follow-up is both slightly more mainstream and weirder, if that's possible. Flight of the Blue Whale tells a story in song of a red fox who operates a small clock and watch repair shop, comes home to find moles invading his garden and the town, and goes off on an adventure to... well, it ends with a flight of a blue whale. What happens in that ellipsis is, frankly, a little confusing and I don't even really think that's the point. Bottom line, the more conventional narrative drive of the story -- whose moral is about taking time to dream and not just work -- is just a structure on which to hang these songs. And the songs are just as odd as their predecessors. The album kicks off with perhaps the most straightforward track, "Red Fox," an indie-pop tune featuring an infectiously catching organ motif, but from that track, we move on to the stomping sound of "Moles on Parade" and the accordion-drenched near-instrumental "Valse de Taupier," one of a couple waltzes on the album. Sometimes Elliott sounds like Tom Waits (as on "Moles" and "Baleen Curse"), but more often his voice will remind listeners of a certain age and sensibility of David Byrne, as on careening "The Plan" and the modern big band sound of "Tunneling to Paradise." The title track (another instrumental) sounds like a Parisian cafe dragged begrudingly out to the seaside. 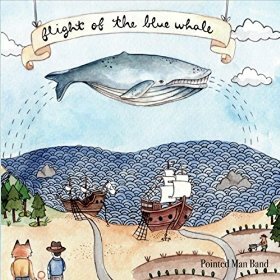 Flight of the Blue Whale is most definitely not an album that will please all listeners. It is, as I've noted, a little confusing in places, esoteric in its musical choices -- it's not eager to please. It is, however, joyful and all those things I just mentioned are also its strengths. Some kids and families will adore this album -- they are the families who probably really liked Wes Anderson's take on The Fantastic Mr. Fox. (Note: We were one of those families. This album is in some sense a spiritual sequel to it.) So, not for everyone, but maybe for you. Definitely recommended. Posted in 5, 6, 7, 8, 9, Reviews and tagged with Pointed Man Band, Portland, Oregon, Dan Elliott, sea songs, moles, red foxes, Tom Waits, jazz, review, reviews.